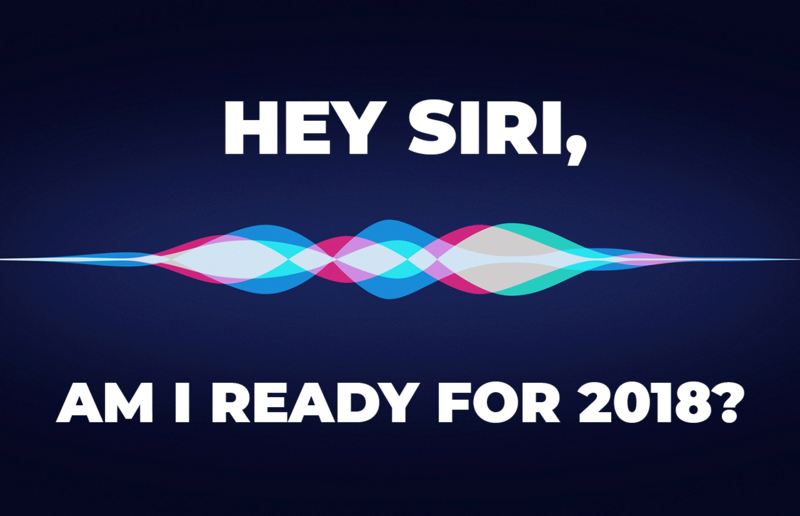 Hey Siri, Am I Ready for 2018? Ah, the smell of 2018 in the morning. But what will it bring? How will 2018 change the way we do business? If it’s anyway as transformational as 2017, can I be prepared? All valid questions as 2017 has cut swaths out of many and built new-fangled superhighways for others. Trust became a battered word in 2017 with ‘Fake News’ taking centre stage after a beleaguered US Presidential Election that saw outsiders like Russia playing a part through persuasive content marketing. With massive ad spends via social media, our new “trust” in un-vetted, un-fact-checked channels to get our “news” and decision-making information may be getting the better of us. We are becoming comfortable with voice search and AI-powered devices and gleefully shouting out Hey Siri, Alexa and OK Google, but do we really understand who is answering our queries? There is no denying the incredible success of voice search powered devices as brands are piling onboard to build strategies around voice technology, and 2018 will no doubt accelerate adoption with wearables you can talk to (and that talk back). If you’re a marketer today and Amazon has just shipped 5 Billion items via Prime in 2017 – with many coming from Alexa engagements – what’s your Alexa strategy in 2018? That’s right, it’s not just Google and Facebook taking over the advertising and marketing world – Amazon is a fierce competitor quietly building up a billion-dollar ad business over the past few years. So you’re going to fight all of this with influencer marketing, are you? Using YouTube creators who are trusted by Millennials and upcoming Gen Z alike – right? Lest we forget some of the glaring lessons on 2017 – like Kendall Jenner and her Pepsi commercial debacle; Felix Kjellberg (aka PewDiePie) and anti-semitism with Disney; and most recently pre-teen fav Logan Paul, who holds sway with over 15 million plus subscribers, signs six-figure deals with major brands… and yes, just stepped way over the boundary (of what he thought was “awareness”) into lousy decision-making when he visited, filmed and posted on a Japanese ‘suicide forest’ complete with dead body footage. Yes, I know brands want to tap into the billion-plus monthly YouTube viewers, but you certainly don’t want some cowboy content creator doing irreversible damage and shedding a bad light on the brand you have worked hard to establish. So make sure you do influencer marketing right with a solid strategy and R&D in place, as it will continue to heavily augment brand generated content in 2018. So if 2017 proved anything, this big beautiful world of ours can be a scary place. But you know what? With change comes opportunity to do things right, To make a difference. To shun negativity for positivity. To substitute exclusiveness for inclusiveness. Let’s tell inspiring stories, embrace diversity, lift each other up and bring a little awesome to 2018 – who’s in?